New iPhone coming on Monday? 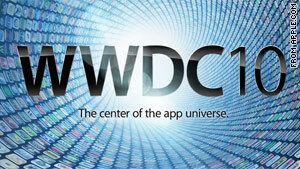 Apple will host its annual Worldwide Developers Conference on Monday in California. CNN's John D. Sutter will be attending the Apple event and posting live updates on the CNN Tech Twitter feed, @cnntech. (CNN) -- Apple fanatics will have their eyes glued on live blogs and Twitter feeds on Monday as the technology giant gears up for big announcements. The Cupertino, California, company -- known for its sleek, mod gadgets -- is widely expected to unveil a new version of its popular iPhone at the Worldwide Developers Conference in San Francisco, California. A keynote address from Apple's CEO, Steve Jobs, will start at 10 a.m. PT. The company does not allow live video of the event, but you can follow the minute-by-minute action on our Twitter account, @cnntech, as well as on technology sites like Ars Technica, Wired, CNET and Gizmodo. The new CNN Tech homepage also will incorporate live posts from inside the event at the Moscone Center. Apple is known for its secrecy, but some tech bloggers have potentially spoiled the biggest reveal of this event by publishing details about a prototypical iPhone. According to Gizmodo, the site that broke the story about the iPhone prototype after paying for the unreleased phone, the next-generation iPhone will have a front-facing camera, a higher-resolution screen, a camera flash and a larger battery. It may be available as early as this summer. Blogs also report that the new iPhone could be called the iPhone 4 or the iPhone HD. The new iPhone, if announced, will come as Apple faces increasing competition from other smartphone makers. In many ways, the company has set the standard for what Internet- and app-enabled phones are capable of. But the Motorola Droid, Google Nexus One and Palm Pre all have proved to be decent competitors to the Apple iPhone in recent months. In the first few months of 2010, phones running Google's Android operating system were more popular with consumers than those from Apple, according to CNET. The BlackBerry, made by Research In Motion (RIM), is still the top-selling smartphone on the market. It is geared toward business clients and doesn't have all of the features that the touch-screen phones do. The iPhone probably won't be the only topic of discussion at WWDC. Expect the company to provide new details about the operating system -- or OS, in geek-speak -- that manages applications on the iPhone and iPad. It's rumored that Apple could announce a breakaway from AT&T, the company that provides exclusive mobile service to the iPhone. And, as Wired writer Brian X. Chen suggests, Apple may make an announcement about a new streaming-video functionality, which would make it easier and faster to view movies and online video on the go.